Chewie is an intelligent cat with distinguished markings and curious eyes. His absolute favorite thing to do is jump high in the air to chase his toys. This good boy is ready to find a home that will have plenty of toys and a warm lap to snuggle. He loves to chat and chirp, so we can only assume he would love a window to sit in and watch the birds. He’s smart as a whip, being the only cat that figured out how to remove drain covers in the shelter and put his toys down the drain! 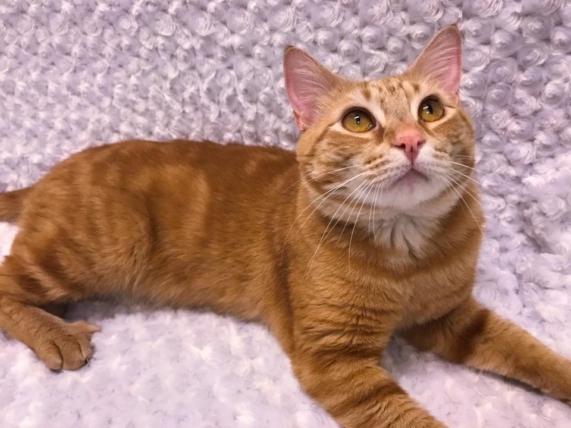 Chewie is a energetic and entertaining cat that will make someone happy for years to come. Chewie doesn’t really appreciate other cats, so he will be happiest as an only cat. He is good with children, but can be a tad rambunctious when he plays.